Born on January 20, 1924 and joined the Armed Forces while in CLINTON, TN. He served as a 76Y40 in the Army. In 18 years of service, he attained the rank of SGT/E5. He began a tour of duty on September 17, 1968. On May 28, 1969, at the age of 45, JOHN TRAVIS DAVIS perished in the service of our country in South Vietnam, Binh Dinh. You can find JOHN TRAVIS DAVIS honored on the Vietnam Veterans Memorial on Panel 23W, Row 7. Born on August 10, 1950 and joined the Armed Forces while in GRATZ, KY. He served as a 00C10 in the Army, and attained the rank of SP4/E4. He began a tour of duty on December 19, 1970. On May 2, 1971, at the age of 20, JEFFERY CAMON GOODRICH perished in the service of our country in South Vietnam, Quang Nam. You can find JEFFERY CAMON GOODRICH honored on the Vietnam Veterans Memorial on Panel 3W, Row 22. Born on October 22, 1949 and joined the Armed Forces while in SANTA MARIA, CA. He served as a 63B20 in the Army, and attained the rank of SP4/E4. He began a tour of duty on October 4, 1969. 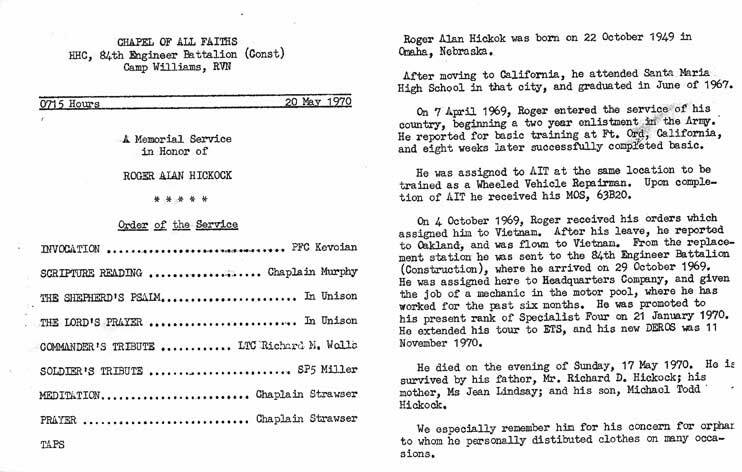 On May 17, 1970, at the age of 20, ROGER ALAN HICKOK perished in the service of our country in South Vietnam, Binh Dinh. You can find ROGER ALAN HICKOK honored on the Vietnam Veterans Memorial on Panel 10W, Row 57. Born on November 16, 1944 and joined the Armed Forces while in WINTHROP, MA. He served as a 91B40 in the Army. In 1 year of service, he attained the rank of SSGT/E5. He began a tour of duty on July 19, 1970. On May 2, 1971, at the age of 26, EDMUND LAMBERT III MACNEIL perished in the service of our country in South Vietnam, Quang Nam. You can find EDMUND LAMBERT III MACNEIL honored on the Vietnam Veterans Memorial on Panel 3W, Row 22. Born on September 1, 1936 and joined the Armed Forces while in JACKSON, KY. He served as a 62G40 in the Army, and attained the rank of SFC/E7. On September 17, 1970, at the age of 34, EZEKIEL FRALEY JR perished in the service of our country in South Vietnam, Pleiku. You can find EZEKIEL FRALEY JR honored on the Vietnam Veterans Memorial on Panel 7W, Row 69. Born on January 3, 1943 and joined the Armed Forces while in LEEWOOD, WV. He served as a 62E30 in the Army. In 6 years of service, he attained the rank of SP5/E5. On February 11, 1968, at the age of 25, DANNY RAY HOWELL perished in the service of our country in South Vietnam, Pleiku. You can find DANNY RAY HOWELL honored on the Vietnam Veterans Memorial on Panel 38E, Row 77. Born on February 3, 1948 and joined the Armed Forces while in MENDOCINO, CA. He served as a 82B20 in the Army. In 2 years of service, he attained the rank of SP5/E5. He began a tour of duty on April 12, 1967. On March 26, 1969, at the age of 21, CLYDE AUSTIN LUCAS perished in the service of our country in South Vietnam, Phu Yen. You can find CLYDE AUSTIN LUCAS honored on the Vietnam Veterans Memorial on Panel 28W, Row 49. Born on September 26, 1949 and joined the Armed Forces while in NESBIT, MS. He served as a 52D20 in the Army, and attained the rank of SP4/E4. On February 6, 1972, at the age of 22, JAMES EDWARD MAXWELL perished in the service of our country in South Vietnam, Quang Nam. You can find JAMES EDWARD MAXWELL honored on the Vietnam Veterans Memorial on Panel 2W, Row 105. Born on June 19, 1947 and joined the Armed Forces while in SALLEY, SC. He served as a 62G20 in the Army. In 1 year of service, he attained the rank of PFC/E3. He began a tour of duty on July 25, 1968. On May 14, 1969, at the age of 21, R J SMITH perished in the service of our country in South Vietnam, Binh Dinh. You can find R J SMITH honored on the Vietnam Veterans Memorial on Panel 24W, Row 12. Born on April 23, 1942 and joined the Armed Forces while in BLACHLY, OR. He served as a 62B20 in the Army. In 8 years of service, he attained the rank of SP5/E5. 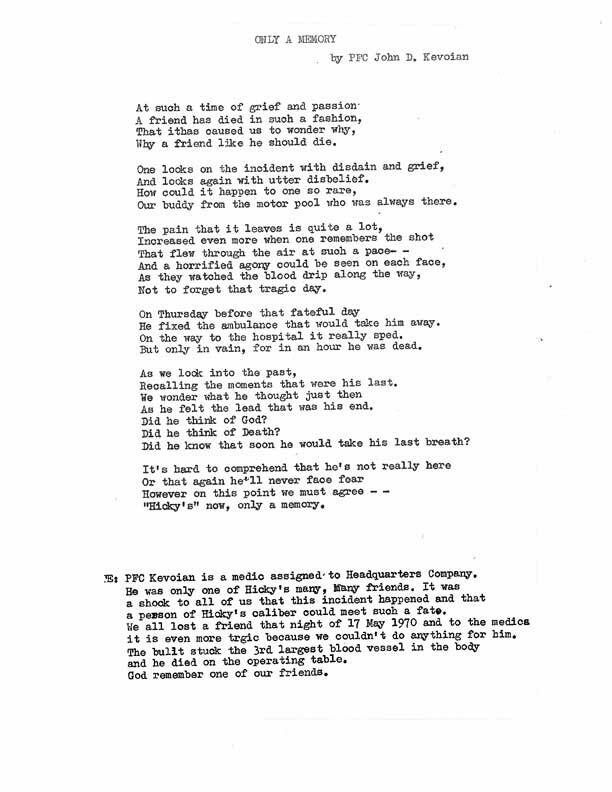 On June 11, 1967, at the age of 25, FRANKLIN JOHN SUMICH perished in the service of our country in South Vietnam, Pr & Mr Unknown. You can find FRANKLIN JOHN SUMICH honored on the Vietnam Veterans Memorial on Panel 21E, Row 92. Born on February 14, 1944 and joined the Armed Forces while in MCMINNVILLE, TN. He served as a 62E40 in the Army, and attained the rank of SSGT/E6. On December 25, 1971, at the age of 27, JAMES CHARLES WATSON perished in the service of our country in South Vietnam, Quang Nam. You can find JAMES CHARLES WATSON honored on the Vietnam Veterans Memorial on Panel 2W, Row 91. Born on September 27, 1942 and joined the Armed Forces while in IDAHO FALLS, ID. He served as a 1331 in the Army, and attained the rank of CAPT/O3. He began a tour of duty on July 9, 1970. On May 2, 1971, at the age of 28, RALPH BRENT CORDON perished in the service of our country in South Vietnam, Quang Nam. You can find RALPH BRENT CORDON honored on the Vietnam Veterans Memorial on Panel 3W, Row 21. Born on August 28, 1951 and joined the Armed Forces while in NEW YORK, NY. He served as a 76B40 in the Army, and attained the rank of SGT/E5. He began a tour of duty on July 28, 1970. On October 24, 1971, at the age of 20, CLIFFORD ARTHUR HOSTEN perished in the service of our country in South Vietnam, Quang Nam. You can find CLIFFORD ARTHUR HOSTEN honored on the Vietnam Veterans Memorial on Panel 2W, Row 50. Born on August 6, 1950 and joined the Armed Forces while in WEST HAVEN, CT. He served as a 51D20 in the Army, and attained the rank of SP5/E5. He began a tour of duty on February 28, 1971. On May 2, 1971, at the age of 20, CHRISTOPHER JONATHA NEALE perished in the service of our country in South Vietnam, Quang Nam. You can find CHRISTOPHER JONATHA NEALE honored on the Vietnam Veterans Memorial on Panel 3W, Row 22. Born on July 17, 1950 and joined the Armed Forces while in ST PAUL, MN. He served as a 62E20 in the Army, and attained the rank of SP5/E5. He began a tour of duty on August 5, 1970. 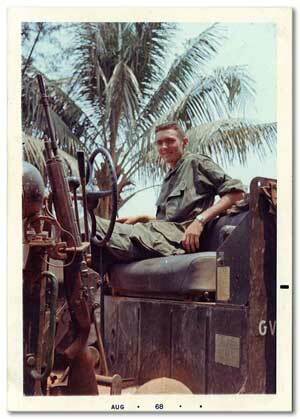 On May 2, 1971, at the age of 20, RONALD JOE LARSON perished in the service of our country in South Vietnam, Quang Nam. You can find RONALD JOE LARSON honored on the Vietnam Veterans Memorial on Panel 3W, Row 22. Born on April 4, 1949 and joined the Armed Forces while in ST LOUIS, MO. He served as a 64B20 in the Army, and attained the rank of SP4/E4. He began a tour of duty on March 30, 1970. On August 23, 1970, at the age of 21, CLARENCE BROWN perished in the service of our country in South Vietnam, Binh Dinh. You can find CLARENCE BROWN honored on the Vietnam Veterans Memorial on Panel 8W, Row 132. Born on December 6, 1949 and joined the Armed Forces while in KANSAS CITY, KS. He served as a 62K20 in the Army. In 1 year of service, he attained the rank of PFC/E3. On February 22, 1970, at the age of 20, JACKIE LEE LEWALLEN perished in the service of our country in South Vietnam, Binh Dinh. You can find JACKIE LEE LEWALLEN honored on the Vietnam Veterans Memorial on Panel 13W, Row 45. Born on August 10, 1947 and joined the Armed Forces while in CHICAGO, IL. He served as a 62K2O in the Army. In 1 year of service, he attained the rank of PFC/E3. He began a tour of duty on November 15, 1969. On December 24, 1969, at the age of 22, EDWARD MORRISON JR perished in the service of our country in South Vietnam, Binh Dinh. 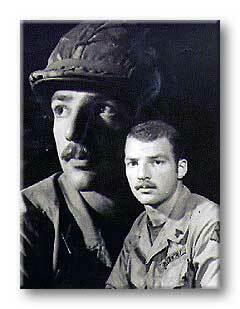 You can find EDWARD MORRISON JR honored on the Vietnam Veterans Memorial on Panel 15W, Row 91. Born on December 10, 1948 and joined the Armed Forces while in PAWTUCKET, RI. He served as a 62A20 in the Army. In 1 year of service, he attained the rank of PFC/E3. He began a tour of duty on December 19, 1967. On January 5, 1968, at the age of 19, ROBERT WILFRED RENAUD perished in the service of our country in South Vietnam, Binh Dinh. You can find ROBERT WILFRED RENAUD honored on the Vietnam Veterans Memorial on Panel 33E, Row 52. Born on June 17, 1949 and joined the Armed Forces while in LOMITA, CA. He served as a 62E20 in the Army. In 1 year of service, he attained the rank of PFC/E3. He began a tour of duty on November 24, 1967. On January 5, 1968, at the age of 18, RAYMOND DENNIS MCGLOTHIN perished in the service of our country in South Vietnam, Binh Dinh. You can find RAYMOND DENNIS MCGLOTHIN honored on the Vietnam Veterans Memorial on Panel 33E, Row 51. Born on January 30, 1949 and joined the Armed Forces while in CANON, GA. He served as a 62B20 in the Army. In 1 year of service, he attained the rank of PFC/E3. On October 23, 1969, at the age of 20, GALEN MINOR SMITH perished in the service of our country in South Vietnam, Phu Yen. You can find GALEN MINOR SMITH honored on the Vietnam Veterans Memorial on Panel 17W, Row 109. Born on February 25, 1947 and joined the Armed Forces while in EAST AURORA, NY. He served as a 51B20 in the Army. In 1 year of service, he attained the rank of PFC/E3. On October 11, 1967, at the age of 20, MILTON SNOW JR perished in the service of our country in South Vietnam, Binh Dinh. You can find MILTON SNOW JR honored on the Vietnam Veterans Memorial on Panel 27E, Row 91. Born on January 11, 1945 and joined the Armed Forces while in STANFORD, IL. He served as a 94B20 in the Army. In 1 year of service, he attained the rank of SP5/E5. He began a tour of duty on September 5, 1966. On February 14, 1968, at the age of 23, DAVID WAYNE PIPPIN perished in the service of our country in South Vietnam, Binh Dinh. 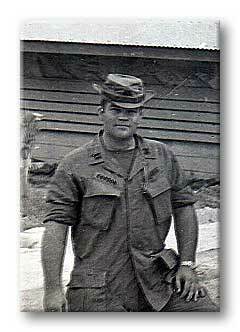 You can find DAVID WAYNE PIPPIN honored on the Vietnam Veterans Memorial on Panel 39E, Row 38. Born on November 27, 1947 and joined the Armed Forces while in BAYTOWN, TX. He served as a 62E20 in the Army. In 2 years of service, he attained the rank of SP4/E4. He began a tour of duty on April 11, 1967. On February 3, 1968, at the age of 20, DANIEL PENA JR perished in the service of our country in South Vietnam, Binh Dinh. You can find DANIEL PENA JR honored on the Vietnam Veterans Memorial on Panel 37E, Row 16. Born on February 27, 1935 and joined the Armed Forces while in BIRMINGHAM, AL. He served in the Army. In 4 years of service, he attained the rank of SP5/E5. He began a tour of duty on June 11, 1965. On July 9, 1965, at the age of 30, SHERMAN ELLIOT WILLIAMS perished in the service of our country in South Vietnam, Binh Dinh. You can find SHERMAN ELLIOT WILLIAMS honored on the Vietnam Veterans Memorial on Panel 2E, Row 34. Born on March 16, 1949 and joined the Armed Forces while in NANTICOKE, PA. He served as a 51B20 in the Army. In 2 years of service, he attained the rank of SP5/E5. On September 24, 1970, at the age of 21, THOMAS HENRY ZAREMBA perished in the service of our country in South Vietnam, Binh Dinh. You can find THOMAS HENRY ZAREMBA honored on the Vietnam Veterans Memorial on Panel 7W, Row 88. Born on January 26, 1944 and joined the Armed Forces while in EL PASO, TX. He served as a 62E20 in the Army. In 1 year of service, he attained the rank of PFC/E3. He began a tour of duty on October 3, 1967. On May 30, 1968, at the age of 24, IGNACIO DURAN perished in the service of our country in South Vietnam, Quang Ngai. You can find IGNACIO DURAN honored on the Vietnam Veterans Memorial on Panel 63W, Row 15. Born on October 18, 1932 and joined the Armed Forces while in BANDY, VA. He served as a 62N40 in the Army. In 16 years of service, he attained the rank of SSGT/E6. He began a tour of duty on March 19, 1968. On December 14, 1968, at the age of 36, RAYMOND DOUGLAS BANDY perished in the service of our country in South Vietnam, Binh Dinh. You can find RAYMOND DOUGLAS BANDY honored on the Vietnam Veterans Memorial on Panel 36W, Row 20. Born on April 6, 1950 and joined the Armed Forces while in UNIONTOWN, PA. He served as a 12B20 in the Army, and attained the rank of PVT/E2. On August 20, 1970, at the age of 20, HORACE LEE WARDELL perished in the service of our country in South Vietnam, Binh Dinh. You can find HORACE LEE WARDELL honored on the Vietnam Veterans Memorial on Panel 8W, Row 126. Born on July 19, 1947 and joined the Armed Forces while in GRANGEVILLE, ID. He served as a 82B20 in the Army. In 2 years of service, he attained the rank of SP5/E5. On May 10, 1969, at the age of 21, ROBERT LEON WILLEY perished in the service of our country in South Vietnam, Phu Yen. You can find ROBERT LEON WILLEY honored on the Vietnam Veterans Memorial on Panel 25W, Row 45. Born on August 26, 1949 and joined the Armed Forces while in MARION, NC. He served as a 62J20 in the Army. In 2 years of service, he attained the rank of SP5/E5. He began a tour of duty on December 17, 1967. On November 26, 1969, at the age of 20, JERRY LANE GREENE perished in the service of our country in South Vietnam, Phu Yen. You can find JERRY LANE GREENE honored on the Vietnam Veterans Memorial on Panel 16W, Row 125. Born on December 12, 1943 and joined the Armed Forces while in ST AUGUSTINE, FL. He served as a 06B20 in the Army. In 4 years of service, he attained the rank of SP4/E4. He began a tour of duty on April 24, 1967. On November 19, 1967, at the age of 23, ROBERT EARL MILLER perished in the service of our country in South Vietnam, Binh Dinh. You can find ROBERT EARL MILLER honored on the Vietnam Veterans Memorial on Panel 30E, Row 30. Born on July 26, 1927 and joined the Armed Forces while in PLATTSBURGH, NY. He served as a 51H40 in the Army. In 20 years of service, he attained the rank of SSGT/E6. On December 14, 1966, at the age of 39, EUGENE EDWARD BONNETT perished in the service of our country in South Vietnam, Pr & Mr Unknown. You can find EUGENE EDWARD BONNETT honored on the Vietnam Veterans Memorial on Panel 13E, Row 42. Born on March 19, 1938 and joined the Armed Forces while in CARLISLE, KY. He served as a 62B40 in the Army. In 6 years of service, he attained the rank of SSGT/E6. He began a tour of duty on January 17, 1966. 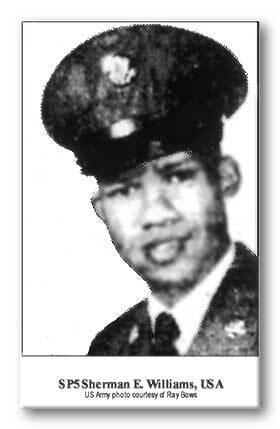 On November 5, 1967, at the age of 29, WILLIE J HOLLAND perished in the service of our country in South Vietnam, Phouc Tuy. You can find WILLIE J HOLLAND honored on the Vietnam Veterans Memorial on Panel 29E, Row 24. Born on May 17, 1946 and joined the Armed Forces while in UPPER DARBY, PA. He served as a 62F20 in the Army. In 1 year of service, he attained the rank of SP4/E4. On September 29, 1967, at the age of 21, RONALD JOSEPH HUMM perished in the service of our country in South Vietnam, Pr & Mr Unknown. You can find RONALD JOSEPH HUMM honored on the Vietnam Veterans Memorial on Panel 27E, Row 29. Born on November 29, 1948 and joined the Armed Forces while in MUNITH, MI. He served as a 61B20 in the Army, and attained the rank of SP4/E4. On July 6, 1970, at the age of 21, WENDALL JOSEPH JARRELL perished in the service of our country in South Vietnam, Binh Dinh. You can find WENDALL JOSEPH JARRELL honored on the Vietnam Veterans Memorial on Panel 9W, Row 124. Born on January 17, 1946 and joined the Armed Forces while in ALTADENA, CA. He served as a 51B20 in the Army. In 1 year of service, he attained the rank of PVT/E2. On April 14, 1969, at the age of 23, JAMES WILLIE WILSON perished in the service of our country in South Vietnam, Binh Dinh. You can find JAMES WILLIE WILSON honored on the Vietnam Veterans Memorial on Panel 27W, Row 84.